Do you have problems with tiny hard shelled bugs on your kitchen countertops (drug store beetles)? Look for answers to getting rid of these pests in this guide. I am having issues in the kitchen with a very tiny bug on my countertops. At first I thought I had spilled coffee grounds, but on closer inspection found out they moved, ever so slowly. Under a magnifying glass you can clearly see they are hard shelled with tiny legs under the bottom side. I've sprayed and tried home remedies and nothing will get rid of them. I clean my countertops everyday and the next day they are back and not just a couple, there must be 50 or more showing up everyday. Has anyone any idea of what I am dealing with? First comes the weevil then this bug. Check your flour and meal for weevils. The best way to avoid this is to place your flour and meal in the freezer when you first come in the house with it. Leave it there 24 hours and you will not get these bugs, but first you need to clean house of them. Then get fresh flour and meal. They were in your products when you bought them. 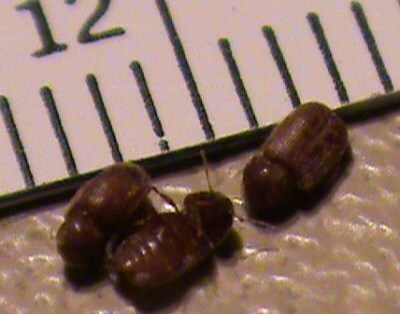 Cigarette and drugstore beetles are two closely related species of small, reddish brown beetles that are moderately common pests in Iowa homes. The cigarette beetle was at one time a very important pest of the tobacco industry and got it's named from the damage it did to stored tobacco. The drugstore beetle gained its name because it was frequently found feeding on drugs in pharmacies many years ago. Now, both insects are customarily found infesting all types of dry stored food products, spices, seeds, grains and dried plant material. We have recently received samples of cigarette beetles found in rice, dried potatoes, paprika, raisins, grain-based mouse bait, dried straw flowers and a table center piece made of varnished bread. Drugstore beetles are known to feed on leather, wool, hair, books and drugs. For both insects an infested item will contain the 1/8th inch long, reddish brown, oval beetles and small, white larvae. Adult beetles often wander away from infested materials and may be found throughout the kitchen or house. Control of cigarette and drugstore beetles requires locating and eliminating the infested item(s). All potentially infested materials should be carefully examined, including unopened boxes and packages. Cupboard shelves holding infested items and shelves in the vicinity of where the beetles have been noticed should be emptied and thoroughly vacuum cleaned. Household cleaners containing bleach or ammonia will have no effect on the insects. This is my photo of my tiny buggers, looks like I have my answer now! This bug question has been asked over and over online. I hope other will see this now and then know just what this mystery bug is ! Besides annoying !! I now remember bring home dog biscuits and after a while we noticed these bugs where in them. They were covering every biscuit and I threw them all in the trash. But it must have been to late. Because that was last year and I still have them. It sounds like there is no easy way to get rid of them fast. Clean cupboards and drawers over and over again is the best answer and check all dry goods over and over. Good news is they are harmless, just annoying as heck. I ordered Tupperware today for all of my dry good foods. These bugs can chew through cardboard and tin foil and they can move about the house into other rooms as well. You may want to put bay leaves in your pasta, rice, flour, corn meal, etc. to repel the little critters. I keep my flour in the freezer, just to be sure I don't get weevils, have had them too many times to count! Tupperware is a good storage solution as well. Finally, after months and months of battling these tiny buggers, we have won! They are dead and gone and I now have very well organized cupboards, drawers, and counter-tops. Everything was examined and just about all of it was pitched. Now everything is in Tupperware and I mean everything. We all buy food in boxes and this is how they get in the kitchen and take root. Mine came in the dog's biscuit treats. Dishsoap helps a lot. In the morning when I woke up I have caught a lot, the straglers that get away. They are hard to get rid of. Put the soap in a saucer, you'll find they come to you. Vacuum the cabinates after you go through everyting. If you have dog biscuits, check them. I dont know if that's what brought them into my house, but I started noticing these bugs everywhere in my kitchen and living room. And today I went to get my dog a biscuit and they have gone crazy in the box of treats. So if you have dog biscuits and you notice these bugs, check there. I bet thats where they are coming from. Put treats in a container. I went nuts trying to get rid of these things over a period of about 6 months but finally found a good solution that seems to have worked. I tossed everything in my pantry that contained grain that was opened. (once again) I got jars to put all my food in moving forward, and I wiped the countertop and cupboards with oil of oregego and put a small bowl with some of the oil in my cupboard. I continued to see some strays for a few days after that, and every time I did, I wiped the entire area with more of the oil. It took care of it. I am going to keep a close eye on it for quite awhile but this seems to have worked where nothing else did. I don't like the smell of oil of oregeno but it doesn't bother me as much as the bugs. These bugs can be incredibly hard to get rid of. They primarily come from flour and rice from the grocery store. First, freeze the flour as soon as you bring it home for 96 hours. It is recommended to store flour, rice or other grains in a sealed container. Once you have this infestation, you need to throw away old flour and/or rice. Then clean cupboards with soap water and make sure to get in every nook and cranny! Putting Bay leaves in with your grains will help deter these bugs from coming back. Another great tip is to rub Eucalyptus oil on your shelves! Good luck. How do I get rid of drug store beetles? They are referred to here as tiny brown bugs on kitchen countertops.